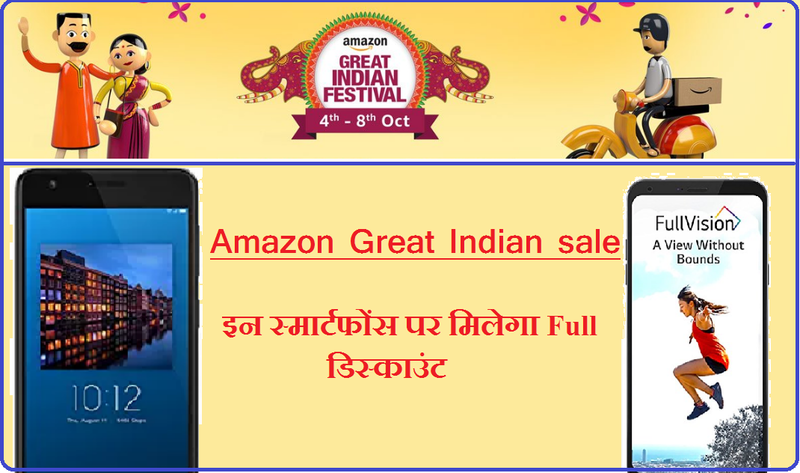 The second cell of the Festival Season on Amazon India has started from October 4 and will continue till October 8 In which you can avail many offers and discounts in different categories. In this cell, you can buy smartphones, not only in low price, but also with many other aafers. If you can not afford the Amazon Great Indian sale in the last two days, today, on the third day of cell you also have the chance to get a device in a great deal. In Amazon Great Indian sale you will find many offers with the cost of the smartphone. Including No Cost Emi option. At the same time, if you use Citibank debit or credit card for payment during the sale, you will get 10% additional cashback benefits. If you use balance on Amazon, you can get 15 percent back. At the same time, the Exchange has also been offered on the smartphone and the price of exchange rates depends on the current situation and model number of your old. Apart from this, if you use the Amazonian app to participate in Amazon Great Indian sale you will get some exclusive offers. By becoming a part of the cell from the app, you will get 15 percent cashback from Amazon Pay. 10% cashback can be availed for Citibank's payment by credit or debit card. Let's know Amazon's Great Indian Cell offers great discounts and offers on the next day. LG Q6: The smartphone with fullvision display, LG Q6, is available in this cell for Rs. 12,990. While its actual price is 16,990 rupees. At the same time, it can be purchased with Exchange Offer and No Coast Emi Option. Apart from that, Geo Users will get 50 GB extra 4G data on its purchase. Lenovo Z2 Plus: In the Amazon cell, a discount of 46 percent is being given on Lenovo Z2 Plus, after which it can buy for Rs 9,799 instead of Rs 17,999. This smartphone can be acquired at the exchange rate of Rs. 8,500. OnePlus 3T: The price of this smartphone is Rs. 29,999 but in Amazon it can be bought at Rs. 24,999 after a discount of Rs. 5,000. OnePlus 3T can be obtained at the exchange rate at the price of Rs 9,500. This price will depend on the model number and position of your old device. Mi Max 2: This smartphone of Shamoi has a battery of 5,300 MAH. The price of Mi Max 2 64 GB variant is Rs 16,999 but in cell it can be purchased for Rs 14,999. No Cost EMI and Exchange Offer can also be availed on this smartphone. 0 Response to "Amazon Great Indian sale Offers"